​To produce a product that can cover all the variable demands in the market and to always exceed our customer expectation. To revisit our business goals to find new ways to enhance our product which will result in more success in our business opportunities. We are fully aware of the importance of our product towards your patient health. Our staff is highly health-conscious and well trained to Not compromise your patient health in any possible way. That is accompanied with a tough quality control system that ensure you and your patient will receive only the best in this matter. One of our Veneer Cases shows the great communication between us and our clients, With the support of our 3shape DSD software planner to design your patient smile, give you a digital Preparation and Gingivectomy guide to help in executing the happy Smile they long for! Learn how to create your 3Shape Communicate account, Use 3Shape Communicate™ from your smart phone, tablet and web browser to send and review scans, case information and treatment designs. Cost-effective temporaries that enable your patients to try on the final crown design as a temporary. Impress your patients with realistic diagnostic Wax-ups that visualize the final design and motivate them to accept your offered treatment. 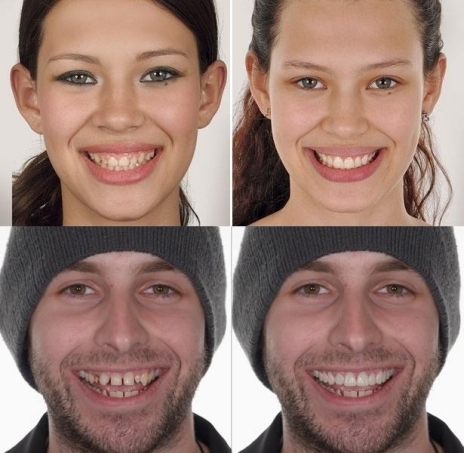 We create photo-realistic visualizations of patient cases by bringing together the patient’s face and teeth designed in 3D. That would give you a powerful motivating realistic tool that will help your patient acceptance for your treatment. Director of Dental Department B.D.S. We at the Bright Smile Dental & Orthodontic Center would like to thank the Professional team at Prodent Dental Lab especcially Miss Mouna Zahra for her outstanding work, her big attention to small aesthetic details. Welcome to Prodent, intelligent and creative customized designs with numerous libraries options and unique, personalized look. Our DSD Software is packed with options amnog which are Hollywood Smiles, Natural designs, powerful Vigorous Styles, Feminine Softer designs and much, much more. Meet Prodent, Perfect solution for your demanding patients, attract your patient with a peroperative 3D Smile Design options that are 100% applicable! Our Designs are not Photoshoped, they are made directly on the patient models and photos. And so you and your patient will get a clear vision of what exactly you will get before starting your preparation. CHOOSE "CONFIGURE" THEN CHOOSE "LAB CONNECTIONS", UNDER "EXTERNAL CONNECTION METHODS" CHOOSE "3SHAPE COMMUNICATE". YOU WILL BE DIRECTED TO WWW.3SHAPECOMMUNICATE.COM , NOW CHOOSE "REGISTER" AND "REGISTER A DENTAL CLINIC" AMD COMPLETE THE FIELDS. 3SHAPE WILL SEND YOU AN EMAIL USE IT TO ACTIVATE YOUR ACCOUNT. SIGN IN 3SHAPE COMMUNICATE.COM AND CLICK ON "CONNECTIONS" AND CLICK "ADD CONNECTION". TYPE IN " MONA@PRO-DENT.NET" AND YOU'LL FIND US LISTED. CLICK AND CONNECT, WE WILL ACCEPT YOUR REQUEST AND YOU'RE READY TO GO!